Roosevelt was homesteaded in 1905. A physical isolation from the larger communities of the Wasatch Front left local settlers to their own means when they needed medical care. After enduring three decades of illness and injury with home remedies and overworked, scarce healthcare providers, the residents of Roosevelt and surrounding communities became convinced that they needed to build a hospital. The LDS church worked with community minded individuals to establish a hospital for the region. The church would fund 60 percent of the building if 40 percent would come from local donations. The corner of State Street and 200 North was selected to be the site for the original hospital. Construction of the hospital began in 1939. The original estimated cost of the facility was $30,000. Local residents and civic organizations, excited about the prospect of a “modern” hospital, contributed all they could, donating labor and cash to assist in the construction. Fundraisers from bake sales to street dances were held to raise the necessary funds. Construction of the hospital was completed in 1942. Two more years passed before the new facility could open because there was not enough money to purchase needed equipment. Once again, residents went to raising needed funds for $20,000 worth of medical equipment. The new Roosevelt LDS Hospital finally opened its doors on August 14, 1944. A public dedication ceremony was held October 20th of the same year. The everyday functions of the hospital continued to rely on a strong spirit of volunteerism. Patient meals were cooked at the hospital on weekdays, but all weekend meals were brought in by community volunteers. The hospital grounds were taken care of and maintained almost entirely by volunteers. Women in the community took on the endless chore of laundering linens, bed sheets and bandages in an era when almost nothing was disposable. All of this was done by a willing community with no remuneration. On April 20, 1968, Duchesne County assumed ownership of the hospital and the facility was renamed the Duchesne County Hospital. On January 25, 1996, the hospital “dba” name changed to Uintah Basin Medical Center. On July 3, 2000, we gained non-profit corporation status. On January 12, 2001, we received our determination letter for 501(c)3 IRS designation. In 2008, the hospital corporate structure changed to allow the organization of the hospital foundation. 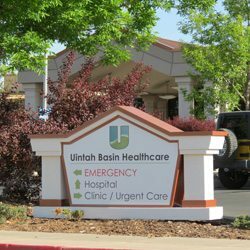 The corporate name of the healthcare system is Uintah Basin Healthcare with the hospital name remaining as Uintah Basin Medical Center. The hospital has progressively expanded by adding more locations, physicians and specialties. The objective has been to provide more specialized healthcare services locally so residents do not have to travel long distances to the Wasatch Front when specialized medical services are needed. Since 1944, we have set out to make improvements in healthcare for Roosevelt and the entire Uintah Basin Region. We are loyal to our community and region, and will continue to strive for excellence in healthcare.